Roundabout Books is an independent discount bookstore in Greenfield, Massachusetts. 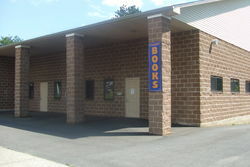 We operate both as an online store and as a neighborhood bookshop. We aim to offer our customers a diverse inventory of fiction, non-fiction, and children's literature at prices that match or beat our lowest internet competitors. Our warehouse-shop is a friendly and helpful place, and we would love to have you stop by. Margaret and Raymond are happy to talk with you about books or just to share our reading space at any time. 30 day return guarantee. Full refund including shipping costs for up to 30 days after delivery if an item arrives misdescribed or damaged. Full refund of purchase price only for other reasons.